The Essential Phone didn't have a hot start when it was released back in August. A delayed release, poor camera performance, and high price tag led many to avoid the otherwise well-received device. But after a few software updates and price drops, it's now a steal of a deal. The team behind the Essential PH-1 has been working hard on fixing their first smartphone's flaws. They've has pushed out numerous updates (mostly addressing the camera performance), including one that made them the first non-Google phone to add the November 2017 security patch. The PH-1 is also one of the few devices with Android Oreo (in the form of a public beta), and it's been successfully rooted and has an unofficial build of Lineage 14.1 available. Put simply, software has now become a strong point for Essential. Recently, the Essential Phone received a price drop to counter its last major criticism. And now on Cyber Monday, we've found its lowest price yet. 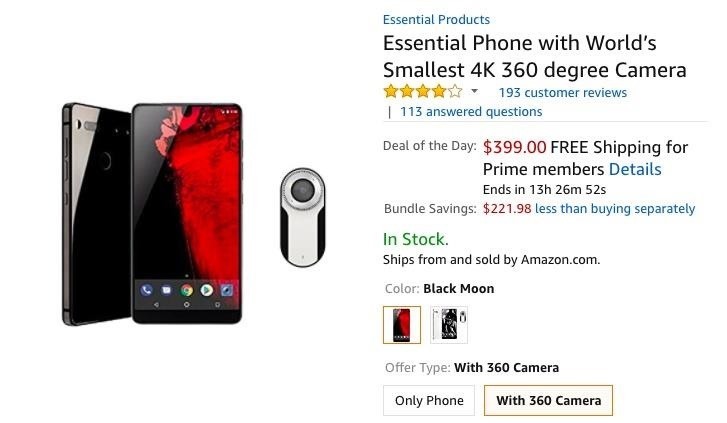 Amazon currently has the Essential Phone with the world's smallest 4K 360° Camera for $399. This is $350 in savings from its original price, and even $50 cheaper than buying the phone by itself at the new reduced price. Both colors are available, but this deal will only last for Cyber Monday (November 27). The deal ends at midnight Pacific time, so you'll have to be quick if you want to snag the PH-1 at its lowest price yet. Considering the bezel-less display and the rest of the Essential Phone's top-notch specs, $400 is an amazing value. With this new price tag, will you soon be the proud new owner of an Essential PH-1? Let us know in the comments below.